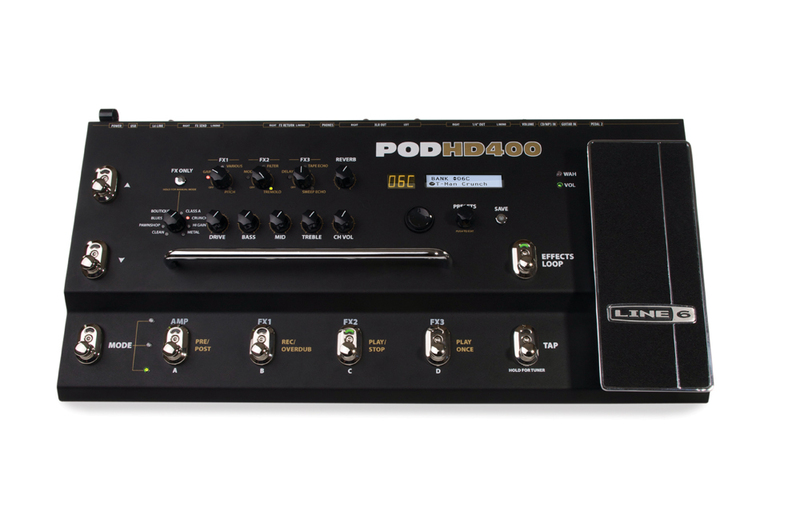 POD HD400, Guitar Amp Simulation Pedal from Line 6 in the POD Live series. yoTrakkz's review"takes a beating and keeps working"
This is a digital amp modeler. I don't think that it can be edited through a Mac or a PC. It's also not MIDI-controllable. The knobs are all on top. It's a completely digital technology. there are basic 1/4" connections. These digital amp modelers have gotten easier and easier to use over the years, and this one isn't really an exception. It's pretty easy to find the tone you're looking for, as they are all pretty easily labeled. Even if you're not a hundred percent sure, it's easy to surf through all of the tones pretty quickly. Using the effects isn't too hard either, it seems like there is an intimidating number of knobs but closer inspection reveals that they are all pretty basic. The manual will explain everything to anyone who doesn't fully grasp what the modeler is capable of doing. I have a bit of a problem with these types of machines, but I'm not sure that my views are shared. I'd heard that this was a good amp modeler for clean tones. When I tried it, I hated it. I realized that most people who say that are probably looking for a supremely clean sound, and not a hint of dirt or overdrive. I like to get at least a little bit of those things from my clean tones, as I play R&B and blues. I was disappointed with this modeler for that reason, there wasn't an acceptable compromise for the clean tones. They all ended up being either too clean or too dirty. I certainly can't crank up my amp and let it rip. Therefore, I must say that if you're in my situation and you aren't a complete tone freak like me, you might be happy with this. Realize, though, that you'll be more than likely to get frustrated with it. These things don't necessarily improve with age. In fact, they're constantly being updated. So be cautious when purchasing. tjon901's review"Slightly better user interface than the 300"
The usability of this board is slightly better than that of the 300. The added buttons on the 400 are for the effects loop and up and down on the preset patch bay. Even with these added controls the screen is still small and it is hard to edit patches on the unit. This unit compared to the 300 is slightly easier to use in a live setting because of the up and down preset button. Apart from that the unit is pretty much the same. There is a 3 way mode switch which is unlabled. It switches between amp mode, looper mode, and preset mode. The unit has all the outputs you could want on the back with headphone jacks unequal outs stereo outs and what not. Sound wise all these models sound pretty much the same in theory. With the 400 and 300 you may not be able to get as good a sound just because it is harder to make patches. With the difficulty in making patches you may not want to take the time to optimize your patches. All the amp models sound as good as the amp they are modeling. These models are the most popular models in the Line 6 lineup and they are modeled in super detail. I mostly use the high gain models and I am pretty disappointed that there are not many of them. If you are a blues or country player or someone who uses a lot of clean tones this amp is the perfect modeler for you. I think these kinds of amps were easier for them to model in HD so they included more of them. These sound good as well but im sure to the tone knobs they all sound like garbage. This unit is the middle unit of the HD line. It has some of the features of the 500 but is mostly like the 300. If you are just going to do home studio stuff I would suggest getting the 300 and using the PC patch editor at all times. 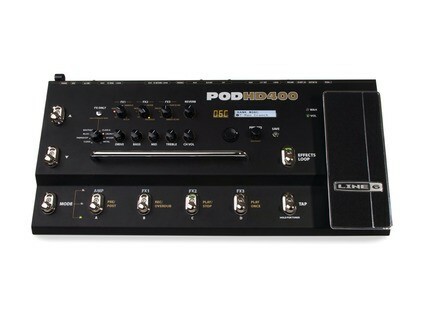 If you are looking for a unit to play live with but cant afford a 500 this is much better than the 300 in live situations. It is much easier to switch between patches with the 400 than the 500 but you still have difficulty editing patches on the unit due to its small screen. 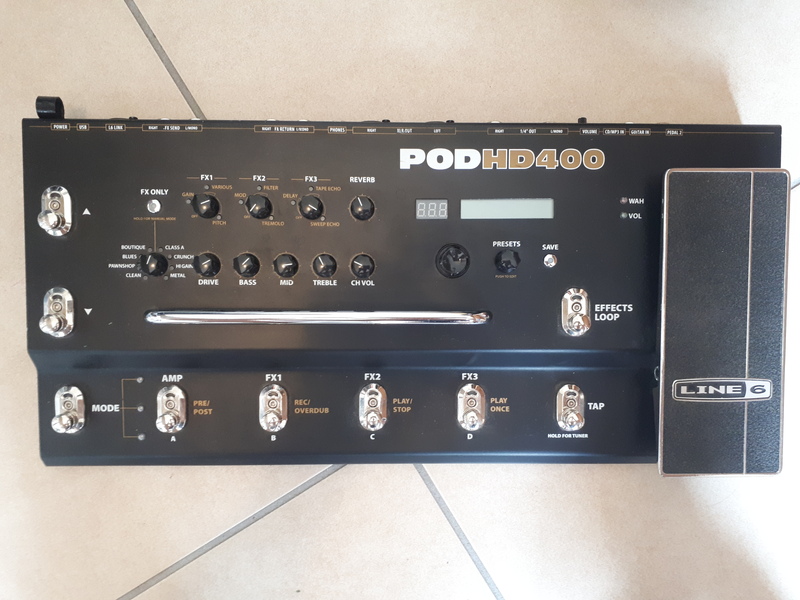 tarz200tdi's review (This content has been automatically translated from French)" Pod HD 300 with FX Loop ... not transparent!" 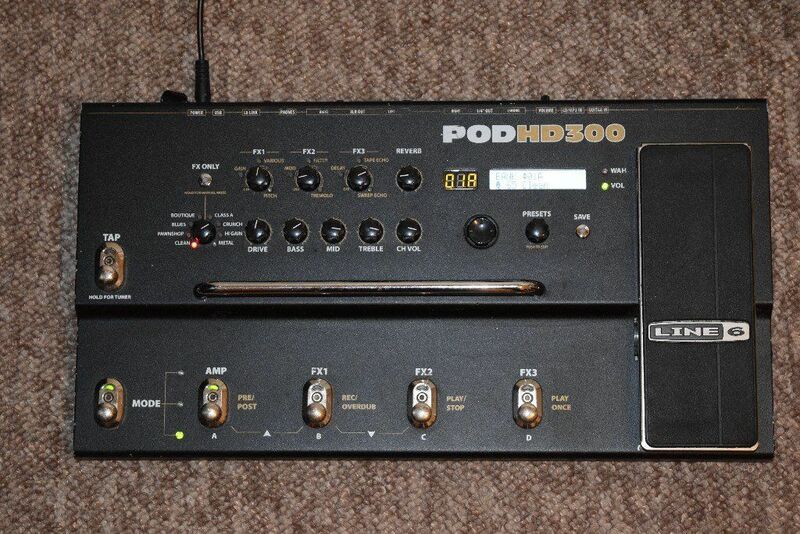 I had a Pod HD 300 which I was pretty happy, but also with an AMT SS-11, I also wanted to use me as POD multi effect only in 4 connection cables, the POD HD 300 not allowed not. When not used the "line6 state of mind", it can be complex, but the sound editing software is to simplify! For a good start, download the advanced guide is also highly recommended, but it is very well made and available in French. After that the possibilities are many, we arrive fast enough to navigate and edit directly on the camera with a little practice. Output is in line headphones (marshall major) or Mac (iMac), or amp on a EHX 44 magnum + orange ppc 112 cab. > In line mode, I am very satisfied. While it will never be worth a great tube amp, but it was still something very convincing. Again, things are not immediate. I found quite quickly cleans and crunch that suited me completely. for distortion sounds, it was longer. I understand that some say simus hi-gain oriented are bad ... However I would say just the job they claim to sound a musical way (gain settings / volume, equalization, the simus HP and microphone are to handle sparingly ... interactions are sometimes bizarre). This is where it bug for my taste ... The effects themselves are rather than quality or high quality, but PROVIDED THEY TREAT THE SIGNAL pod and not necessarily something else ... For example simus modulation and time are objectively super beautiful ... except when dealing analog signal coming from outside ... then it becomes ... toc. However, having paid 400 at the price I sold her little brother, I do not insomnia. JeanMoks's review (This content has been automatically translated from French)" Super satisfying!" Will not go back on the characteristics (known and overcrowded ...). The general configuration is fairly simple as long as one passes by HD-Edit, where everything is clear and super vision. We see the effects chain and how to apply the simulation parameters (amps, speakers, microphone and positioning of the latter). on the other hand, direct editing of the beast is more difficult and requires a two-line LCD screen a bit tight. The manual is clear and comprehensive, but again, with HD-Edit you can easily do without. I would on this point the same remark as some I've discovered with disappointment that the reverb effect accounted for a ... mandatory. So it does really only 3 different effects combined. The looper seems small at first (24 seconds), but in the end, that's enough when you want to loop a little riff to embroider over. I was very pleasantly surprised by the quality of models (I had heard the worst of this kind of tool). This is frankly realistic, especially on clean tones or with a little crunch. The number of simulations is more than enough to me. The factory presets are not used much, except to make a comprehensive demo of the possibilities of the beast. Even if carricaturaux, some effects are fun. I use it for nine months, especially for playing guitar with headphones and import it into my DAW. I am super happy and I would do 10 times that choice. The value for money looks good to me, but I have not found its strength in a live environment (which is still its primary function ...). Quibble (in form) to the tuner that is not really accurate, not very useful.